On the DVD, Thomas Edison’s Secret Lab: Rock It to the Moon, the Secret Lab Kids are ready to demo their new science song for web entrepreneur Mook Zookerboom when he learns that a satellite is coming down out of orbit, panics and heads for the airport. So the team must gather some data on gravity to convince him to return. Then, when Von Bolt accidentally destroys the museum’s new moon rock, the Secret Lab Kids must find a way to replace it. Enjoy these adventures and more with the Secret Lab Kids. KIDS FIRST! Film Critic Benjamin P. comments, “Thomas Edison’s Secret Lab: Rock It to the Moon is a fun, educational series that made me laugh while I was learning. This show teaches new cool stuff about gravity, nanobots and the birth of the remote control.” Giselle T. adds, “It truly makes education fun. Its language is easy to understand, giving young viewers the ability to process the information presented. This is an excellent educational series with each episode containing a different message.” See their full reviews below. Thomas Edison’s Secret Lab: Rock It to the Moon is a fun, educational series that made me laugh while I was learning. This show teaches new cool stuff about gravity, nanobots and the birth of the remote control. Angie, Kent, JD and Nicky are back with Thomas Edison and Von Bolt the robot to solve all kinds of problems by going back in time to learn from pioneers in science throughout history. In the first episode, Dancing Machine, Von Bolt is invited to try out for a dance competition. The gang and Thomas Edison realize that he’s not such a good dancer and decide to build a remote-controlled suit so Von Bolt can make it to the show. They use the virtual reality room to travel back to Spain in 1903 and discover how to use radio and remote control from Leonardo Torres y Quevedo, an engineer and mathematician who created one of the first designs for a remote-controlled device. My favorite episode is Murphy’s Law of Gravity. The kids are trying to impress web celebrity Mark Zoomerboom with their song about science. Instead he discovers a satellite is falling out of the sky and he panics. The kids must find a way to keep him calm to get their song to go viral. This episode was laugh-out-loud funny and there’s a cool gag with penguins to watch out for. My favorite character in the series is Thomas Edison (Livingston Taylor) because whenever the kids are under pressure or doubting themselves, he comforts them and gives them good advice. I really hoped there would be an episode in this volume that showed how the kids found the lab but that is a loose end for me in the story line and I hope they work it in on a later volume. Some of the other episodes I liked are Rock It to the Moon because they talk about gravity. Another episode I enjoyed is Nanobots Byte because I didn’t know what nanobots were. They are really, really tiny robots – and the episode helped me understand how they work. I like the music videos in this volume even more than the first DVD, Secret Lab Meeting. Some of them are really catchy and some of them are just kind of weird. I recommend Thomas Edison Secret Lab: Rock It to the Moon to ages 5 to 12. Kids will fall in love with this show pretty easily and I think there are some pretty advanced subjects that older kids might want to learn about. I give Rock It to the Moon 3 out of 5 stars. I recommend you science fans watch this show that presents high-level science with high amounts of fun. 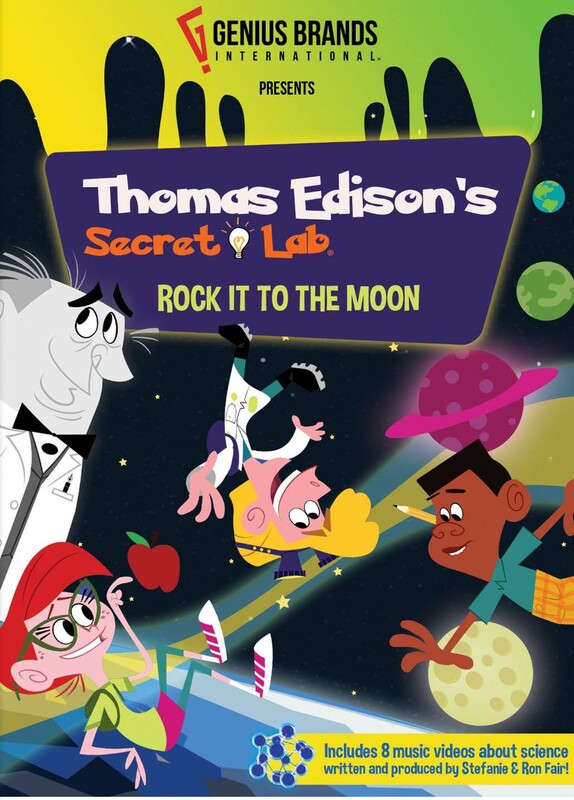 Thomas Edison’s Secret Lab: Rock It to the Moon is in stores April 26th so, go check it out. Very entertaining and informative, the animation is filled with vivid color which draws your attention. It truly makes education fun. Its language is easy to understand, giving young viewers the ability to process the information presented. This is an excellent educational series with each episode containing a different message. In the first episode, the robot teaches the viewers to never not do something because they are told not to and to just be happy doing what you love. The series teaches various things from human anatomy to space science. For instance, they explain gravitational pull and how it differs from in space versus on Earth. I learned that the quantity of atoms doesn’t change but gravitational pull makes you weigh less on the moon and the closer the object, the greater the gravitational pull. Jupiter has more mass than Earth which means it has more gravity and, according to the show, it would be less fun there due to the fact that you couldn’t float around. The show uses comedy as well to get its point across. Every episode has an adventure or a problem to solve. Writers Steven Banks, Steven Darancette and Brian Stampnitsky excelled at creating such a cute show that inspires its audience. In fact, it encourages kids to be scientists. Angie, played by Phillipa Alexander who has a lot of experience doing voice-overs for animated films and, it’s great to see her here. I like how they have included text when songs come up. It’s a small detail that helps you grasp the significance of the words in the songs. My favorite scene is in the first episode. When learning about space, the characters portray what is being taught by some green aliens and one of them gets attached to the moon due to the fact the gravitational pull has increased as a result of the mass of the moon. This part was just very funny. I recommend this animated film for ages 2 to 6 and give it 4 out of 5 stars. It is available on DVD now so, go check it out. Ratchet & Clank tells the story of two unlikely heroes as they struggle to stop a vile alien named Chairman Drek from destroying every planet in the Solana Galaxy. When the two stumble upon a dangerous weapon capable of destroying entire planets, they must join forces with a team of colorful heroes called The Galactic Rangers in order to save the galaxy. Along the way they’ll learn about heroism, friendship, and the importance of discovering one’s own identity. KIDS FIRST! Film Critic Abigail Zoe L. comments, “From the beginning to the end, the film kept me on the edge of my seat, as it is an adventurous, funny, heartwarming and witty story.” Ryan R. adds, “From the beginning to the end, the film kept me on the edge of my seat, as it is an adventurous, funny, heartwarming and witty story.” See their full reviews below. I love the animated movie Ratchet & Clank which is based on the popular Play Station video game. From the beginning to the end, the film kept me on the edge of my seat, as it is an adventurous, funny, heartwarming and witty story. One of the funniest scenes is when Dr. Nefarious shoots Chairman Drek with a laser gun and turns him into a sheep. 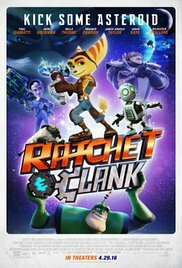 The story follows the main character, Ratchet who wants to be a member of the famously respected Galactic Rangers team but unfortunately, is told he doesn’t have the right “stuff.” According to Captian Qwark, Ratchet may have heart but physically just doesn’t measure up as he is too small. However, Ratchet meets and names a robot Clank who is similarly small and both human and robot not only become the best of friends but a powerful duo. Together they make it their mission to try to save the Solana Galaxy from the evil Chairman Drek. My favorite part of the story is when we learn the robot doesn’t measure up to his own kind. In fact, he is considered a “defect” to be terminated because he’s small, thinks for himself and doesn’t want to hurt humans but wants to help them. I particularly enjoyed all the various voices talent for the animated characters. My favorite is that of Ratchet’s and I was fortunate enough to personally meet and interview both James Arnold Taylor and Bella Thorne (the voices of Ratchet and Cora) immediately following the movie screening. I loved seeing how their actual facial characteristics and physical mannerisms are incorporated into their animated on-screen film characters. There’s not just one moral to this movie but three stand out in my mind. First, is to always believe in yourself and never give up. Second, as told to Ratchet, “To be a hero you don’t have to do big things just right things.” Third, if the right thing requires you to do the wrong thing then probably the right thing is the wrong thing to do. I love these golden nuggets that make the characters seem very real as cleverly penned by the director, Kevin Munroe. All ages will like Ratchet &Clank and it’s particularly well suited for ages 5 to 12. There’s no bad language that make it appropriate for young audiences. The sophisticated storyline, fun adventure, basic struggle of good vs. evil and plenty of twists and turns will appeal to more mature audience, as well. It’s also a story about two underdogs who together try to rise to the challenge. Do they succeed? Well, you’ll have to see the movie to find out! Finally and on a personal note, I just love the relationship between Ratchet and Clank – two orphans in the universe finding each other and creating a lasting bond. Together the dynamic human and robot duo try to do the right thing in the right way. I can’t wait until the sequel or maybe even a TV series. I give this film 5 out of 5 galactic stars. Go see this movie. You’re going to love it! I was very entertained watching Ratchet and Clank, which is a CG animated movie based on the iconic PlayStation video game. Its animations are delightful and it has a great plot. Ratchet and Clank prove that, if you want to do something, it is not the size of the individual that matters it’s the heart! In this movie, we meet Ratchet (James Arnold Taylor) who is the last of his kind, a foolhardy “lombax” who has grown up alone and dreams of being a Galactic Ranger, a well known hero. When he meets Clank (David Kaye), a small-sized robot who helps him accomplish his dream. Together they join forces with a team of interesting heroes called The Galactic Rangers in order to save every planet in the Solana Galaxy from being destroyed by the alien, Chairman Drek. I enjoyed this movie and I think other kids will enjoy this film. I loved watching this movie because the CG animation is amazing and the colors are very vivid and rich. The characters look great. It looks very child-friendly for younger audiences. I was satisfied with the comedy, because the jokes are funny and some of them are related to technology in our everyday lives. I enjoyed the plot of the movie because it tells a wonderful story of Ratchet and Clank without doing a disservice to the franchise. I also loved the voice acting performances of Paul Giamatti, John Goodman, Bella Thorne, Rosario Dawson, Jim Ward, James Arnold Taylor, David Kaye, Armin Shimerman and Sylvester Stallone. They all give stellar performances suitable for their characters. This movie also has a nice pace. It’s not rushed and doesn’t drag either. I can’t say anything negative I have to say about this film. This movie has messages about friendship, heroism, discovering one’s identity and the importance of listening to each other. It also shows that you should think before you act. These lessons can help kids learn about the importance of listening and understanding. I give this film 5 out of 5 stars and recommend it for kids ages 4 to 18. I think adults might like this as well. I also recommend it to people who like family, action, adventure, movies based on video games and comedy movies. It’s in theaters April 29, so make sure you go see it with your kids. Albert Up, Up, and Away! is a cute animated DVD for younger kids that delivers positive messages about friendship, kindness and making smart choices. The story revolves around two best friends, Albert and Egon and the adventures they share. Not an average kid Albert learned to walk and talk at two months old. He has a tenacity for getting into trouble but never on purpose. His parents knew he would change the world one day. 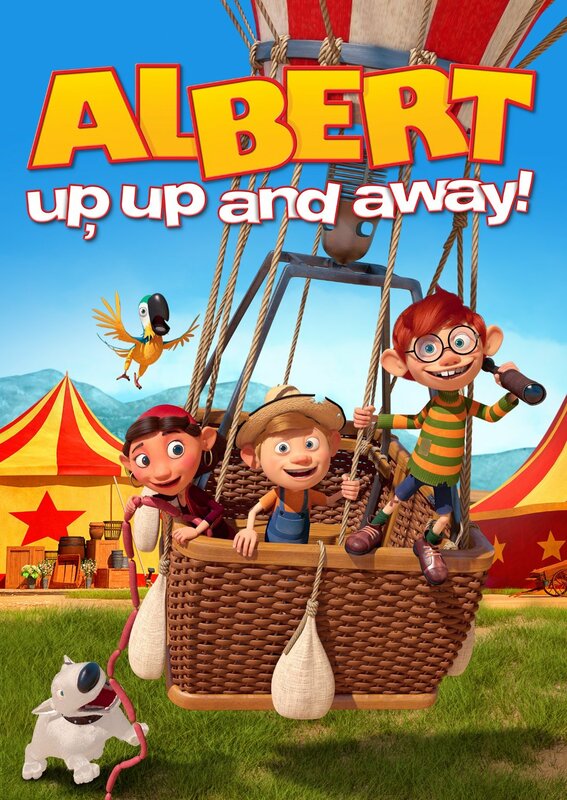 Years pass and Albert decides he wants get an air balloon and become its captain so he can replace the statue that he accidentally destroyed when he was younger. His best friend Egon wants to become a pirate captain. However, a mean bandit takes advantage of the bewildered boys and wants them to help him steal the world’s biggest diamond. Together they have to face this obstacle while their adventure develops. This is a good film. The animation is well done but I found myself comparing it to other animated and it scores about average. I liked it although the storyline was too predictable for me, and the pace a bit slow. It is definitely better suited for a much younger audience. I recommend it for ages 3 to 7. It has good, clean humor and lots of action scenes, which younger kids would enjoy. The menu offers scene selection, trailers and setup. Or you can just play the film. I enjoyed the scene selection feature because it makes it easy to return to where you left off. I enjoyed the trailer because it filled me in on what the movie looks like and gave me the general idea about the film before I started watching it. I give this film 3 out of 5 stars and recommend it to people who like action, adventure and children films. It is now available now on DVD so, so go check it out. Albert Up, Up And Away! I found this movie to be very cute, quirky and funny. At first this movie reminded me of Dennis the Menace as it starts off in super hyper mood, but as the movie moves forward Albert calms down. I found this movie to be very cute, quirky and funny. I loved the graphics and all the detail that went into creating the village scenes. It is crisp and clear and has incredible dimension to it. I re-watched the scene when Albert flies down a hillside in a barrel several times because it is so amazing and laughable. The characters are like most kids their age. You can see yourself hanging out with them. Albert is my favorite because of his great heart and his willingness to tackle anything, to do the right thing and make people happy. He is very trusting which gets him into all kinds of trouble. This makes him a believable kid because, really we all want to trust people and believe that they are all good at heart. Unfortunately, there are bad people in the world that muck it all up. The street market is full of rides, food and games. It made me think of summer and I wanted to join in on the fun. One of the many lessons learned here is “do not steal.” It’s a great lesson everyone should learn. Also, I know that it is hard for children to know who to trust and who not to. Another less is “you can’t trust everyone you meet.” Friendship is very valuable as friends can help you out. Last lesson: If you make a mistake, just admit it and have an adult help you figure out a solution. This was a very funny film with lots of lessons and laughs. I love that this was released in countries other than the United States such as Denmark. They use words which are not in our everyday vocabulary such as cheeky, which is my new favorite word. I recommend this film for ages 5 to 18 and give it 4.5 out of 5 hot air balloon stars. It is quirky and funny and a cute comedy – sure to make you laugh out loud! The Little Prince: The Planet of Bamalias – Not Your Average Fairytale! On Planet Bamalias, the Little Prince will go through a terrible experience – he loses his memory. And can’t remember where and why he is there! Planet Bamalias is at the center of five other planets and all these planets depend on it for their survival. Fox tries to help him and slowly, the Little Prince remembers. But will he remember everything in time to save the Bamalias constellation? KIDS FIRST! Film Critic Shelby R., comments, “The Little Prince: The Planet of Bamalias is not your average fairytale. It is everything but predictable. Just when everything starts to be okay, the evil Snake appears and causes chaos.” See her full review below. The Little Prince: The Planet of Bamalias is not your average fairytale. With many twists and turns, The Little Prince must undertake a difficult journey to gain his memories back and stop the vicious Snake from fulfilling his evil plans to destroy planets. It is the fight between what’s right and what is worth fighting for. This is a fight worth watching. This film is everything but predictable. Just when everything starts to be okay, the evil Snake appears and causes chaos. The most memorable moment is when The Little Prince has a flashback about saving his best friend, Fox. Fox needed the Little Prince to help him get out of a volcano that the Snake threw him in. As they try to get out, the Little Prince finally realizes that he possesses power within himself to conquer all things. It was very sad because he had to decide what was more important friendship or love. Usually my favorite characters are the heroes but here, Snake is my favorite. Although he is bad, there is just something enticing about the way he moves. I love how he disappears and reappears in a matter of seconds. The editor builds suspense by having dark music play just before he appears. The best characteristic of Snake is his ability to change his form and feed off of people’s fears. This film stands out from others because the director doesn’t set a limit to his creativity and imagination. The plot is well developed and the setting takes place in a different galaxy where things are quite different. That is one of the reasons why I recommend this film to ages 4 to 10 because it is an escape from reality but it also discusses important lessons. One of the most important messages is that you should fight for what you believe in. Kids would really identify with the Little Prince because he is little kid trying to learn from his own mistakes and to do the right thing. Parents can really appreciate that this film is educational and encourages the viewers to never give up. I give this film 5 out of 5 stars. 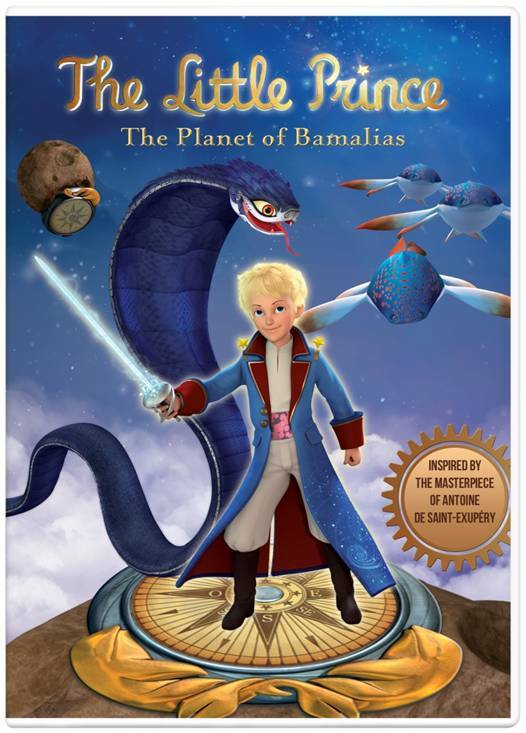 The Little Prince: The Planet of Bamalias is now available through DVD so, go check it out. Posted in DVDs Released | Comments Off on The Little Prince: The Planet of Bamalias – Not Your Average Fairytale! The film takes place in an alternate Paris of the 1940s, where France is ruled by a totalitarian regime. There are two Eiffel Towers and the Parisians go around in blimps powered by bicycles. April is a third generation scientist. Her grandfather and both her parents are chemists. But, her parents disappear early in the film when hunted down by the authorities. The scientists of the world have been disappearing and her parents are the most recent casualties. April lives in a secret hideout in the head of a massive public statue with her intellectual, talking cat, Darwin. She is the last scientist to evade capture. The adventure heats up when a robotic rat tells her that her parents are still alive and being held captive in a jungle laboratory. With the help of her Grandfather’s inventions, Darwin and Julius, a shady, police informer, April goes in search of her parents. Thus begins an incredible adventure. April and the Extraordinary World has a magical, hand-drawn, animation style. Although it has a very gray palate, the film is highly inventive and has a fresh feeling, compared to the computer generated animated films that we are now accustomed to. You can see the dedication and effort of the creators in each frame of the film. The film also has a strong moral message about pollution, conserving the earth and responsible science. There’s a poignant scene where her Grandfather tells her to meet him at the “Oak”. It’s the last tree in Paris and it’s exhibited in a conservatory! April and the Extraordinary World has won a Cristal award at the Annecy International Animated Film Festival and was nominated for a Cesar last year as well. It is 105 minutes. The film is appropriate for 8 to 18 year olds. I give April and the Extraordinary World 4.5 out of 5 stars. April and the Extraordinary World is hard to describe but fun to watch. This is a science fiction film with sprinkles of history, science, comedy and action. April, an independent girl who doesn’t give up, and her talking cat Darwin take you along on a thrilling ride through a gloomy past that shows you how important science and history are to where we are today. This animated film made me think and kept me on the edge of my seat. Inspired by the works of French writer Jacques Tardi, April and the Extraordinary World starts out in 1870 when Napoleon III wants to create an invincible army. His project fails and unleashes two super lizards into the world. This change in history causes a world many years later that relies on steam and coal. In that dark dystopia, we meet a girl named April, who has inherited a knack for chemistry from her ancestor, the scientist at the center of Napoleon III’s plot. April’s parents are about to discover, at last, an invincibility serum. They are about to test their creation when, they are pursued by the authorities and the ruthless inspector Pizoni (Bouli Lanners). April’s parents mysteriously disappear. After April escapes the police and avoids going to an orphanage, she decides that she must live by herself on the streets with her cat Darwin. Ten years later, April gets a message from her father through a bionic rat spy and is convinced her parents are still out there. With the help of her cat, a street kid named Julius (Marc-Andre Grondin) who is not as he seems and her grandpa Pops (Jean Rochefort), she intends to find her parents. My favorite part of this film is when Pops' house turns into an almost spider-like vehicle so April can escape from a mysterious dark cloud that seems to be chasing her. The scene has high-octane action that kept me on the edge of my seat for the entire scene. My favorite character is Darwin the cat because he is very funny and is very loyal to April throughout the film. This film is surprisingly good and different than most other animated films. The filmmakers make the steam-punk world look very cool and science fiction fans will enjoy it. I definitely wouldn't recommend this movie for really little kids even though it’s animated. You have to know a little bit about science and history and there is gun play and scenes of peril. I give April and the Extraordinary World an age rating of 10 to16. Adults will also enjoy this film. This film was made in France and thanks to GKIDS is distributed in the United States. This film has been released in two different versions - one in French with subtitles and one in English. They are both in limited release, so if you can it find playing at a theater near you, I highly recommend you see it. I give April and the Extraordinary World 4 out of 5 stars. You are currently browsing the KIDS FIRST! News weblog archives for April, 2016.